The fascinating and beautiful Tubipora sp. 3. Astonishingly little is known about the organ pipe corals, genus Tubipora, either scientifically or aquaristically. Occasionally we encounter rare, unusual polyp forms, but these are usually labeled Tubipora musica, and they surely cannot all be lumped together as one species. In this two-part series, we take a closer look. Mozart once wrote in a letter to his father that the organ was the queen of all instruments. 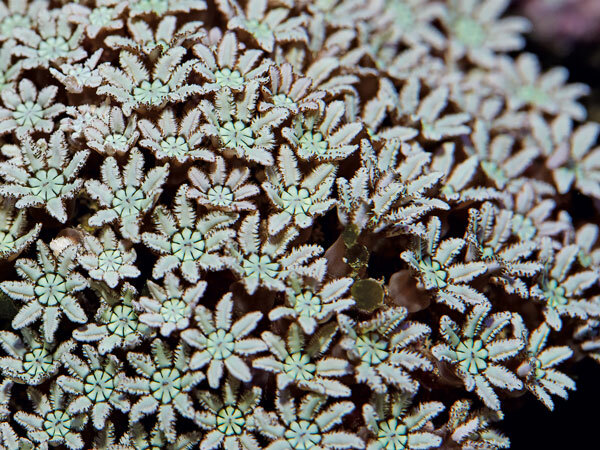 The organ pipe corals, although named after the pipe organ, possess no royal status; in fact, they are almost like wallflowers among the corals. Although they have been known for 370 years, even today nobody is in a position to identify a single species with certainty, and little is known about the distribution of the individual phenotypes—distinctive types grouped mostly by their physical appearance or morphology. This Tubipora sp. 1 (likely T. musica) exhibits the typical skeletal structure of an organ pipe coral. The majority of organ pipe corals, some of which may deserve the taxonomic rank of species, are found at considerable depth, especially on reefs in the Fiji Islands. Many of the phenotypes (I deliberately avoid the term species) encountered there have been found almost nowhere else and, historically, most original descriptions are based on specimens from there. To date, only two different phenotypes are known from the brightly lit shallows, one with a wide distribution and the other mainly from the Fiji Islands. For this reason it seems possible that the genus Tubipora originated in deep water and a few subsequent phenotypes were able to adapt to stronger illumination and get established in shallow water, but this is pure speculation. Organ pipe corals have long been known in the aquarium trade and today usually grow very well, but most aquarists don’t consider them especially exciting. Still, they play an interesting role, because they are representatives of the octocorals (Octocorallia), often termed “soft corals” in the aquarium hobby, but they form solid skeletons. 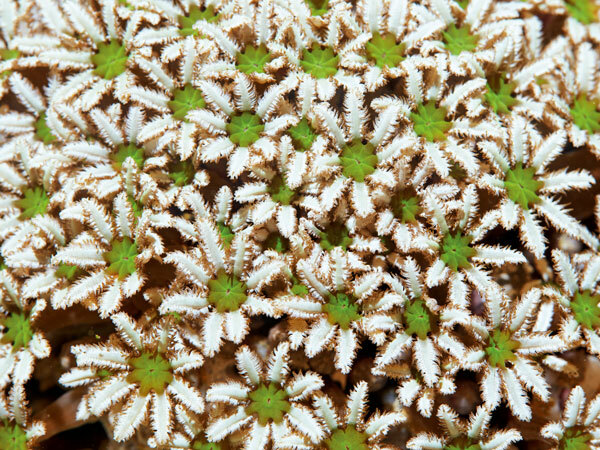 They are virtually always labeled Tubipora musica, regardless of the appearance of the polyps. This puzzled me, and I decided to investigate the identity of these corals more closely. I have always been particularly interested in corals whose scientific placement is unclear, whether they were known to science (e.g., Alcyonium [=Metalcyonium] verseveldti, Acrossota amboinensis, Sarcothelia edmondsoni) or still undescribed at that point (e.g., Phenganax parrini, Knopia octocontacanalis). All of these corals were being kept in the aquarium at the time that I ran across them, but their scientific classification was unknown in the hobby (Knop 2008, 2012 a, b, c). Lasting misidentifications are common in the marine hobby: for example, most marine aquarists erroneously call Alcyonium verseveldti by the name Sympodium, an error that is practically impossible to eradicate. Tubipora sp. 6, fluorescent shot. 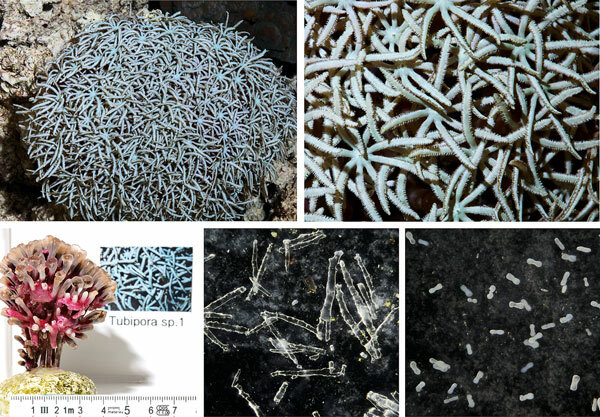 The taxonomy of Tubipora is far more complicated, with science in a state of confusion. 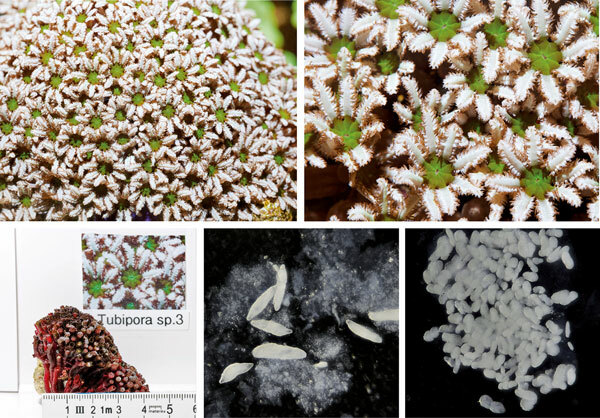 Depending on the biologist cited, there are five to seven valid Tubipora species, and a whole series of different Tubipora phenotypes with completely different polyps that can be collected from the reef, but no one can say for certain which name applies to which of these corals and which are still waiting a valid description. A number of them have been scientifically described, but little is known about them. In order to justify these statements, which may initially sound exaggerated, I must go back somewhat further. The genus Tubipora was erected in 1758 by the Swedish naturalist Carl von Linné. Its parallel tube-like structures reminded him of the pipes of a church organ, so he named the species Tubipora musica. But this coral, with its peculiar skeleton, already had a long history. Back in 1651, doctor and anatomist Johann Caspar Bauhin had described it as Coralliis affine alcyonium rubrum (Hickson 1883), and in 1719 J. P. Tournefort gave it the popular name organ pipe coral. 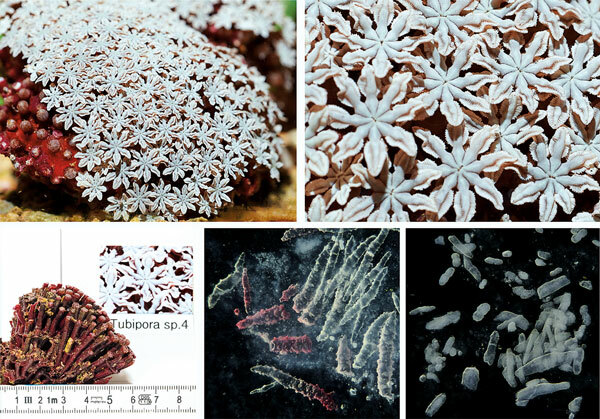 In Indonesia, large numbers of Tubipora sp. 1 skeletons are harvested, cleaned of polyp tissue, and sold as curios or aquarium decor—a practice banned in many other countries. We must remember that naturalists back then had very limited opportunities: it wasn’t possible to dive to any depth or take photographs of subjects. Drawings of corals were often prepared from memory, not by gifted artists but by naturalists whose main talents lay elsewhere. In addition, the preservation of the reference material that must accompany every original description (holotype and paratypes) was undertaken in different ways. Not every researcher had the means to preserve specimens; if specimens were taken on a long sea voyage, for example, they were often dried. Usually, corals were preserved in alcohol. Few of the researchers active at the time actually had the opportunity to observe these corals living in the wild. Even if a living coral was available, perhaps on an expedition ship, the polyps probably would have been completely retracted. Nowadays we must assume that drawings of the polyps often represent what was left of the preserved polyps after dissection, and that doesn’t necessarily agree with every detail that can be seen in living corals today. This makes it extremely difficult to find a match for a live coral in historical descriptions. In some early descriptions, the polyps aren’t even mentioned; the researcher refers to the skeleton alone. 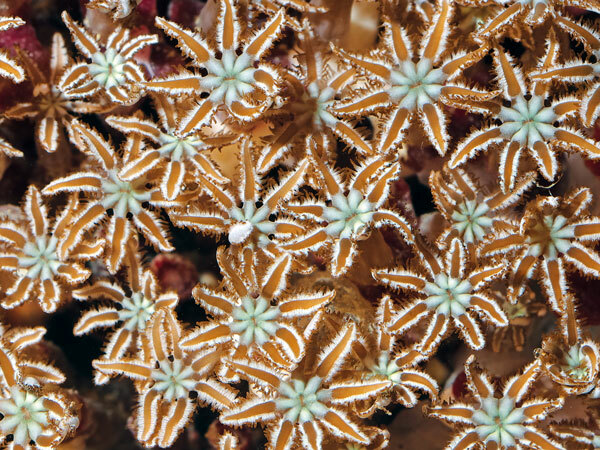 Early descriptions by Dana and others show that, out of necessity, far less attention was paid to the polyps than to the skeleton, which was measured and compared meticulously in every detail, as is done in the study of stony corals. 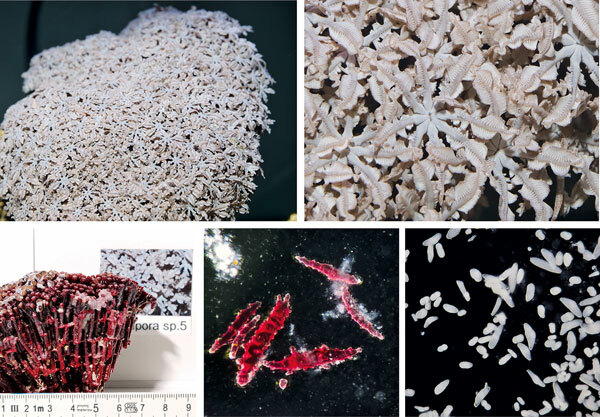 But environmental factors have far more influence on skeleton formation in Tubipora octocorals than in stony corals of the order Scleractinia. In addition, the skeleton of a stony coral is considerably more informative than that of a Tubipora, if only because of the presence of septs, which are invariably species-typical. It is true that organ pipe corals generally exhibit certain differences between the species, such as the diameter of the individual pipes, but many of these variations are adaptations to environmental factors. Measuring the distance between the pipes or their length doesn’t permit reliable identification at the species level, but that wasn’t known back when the early descriptions were made. 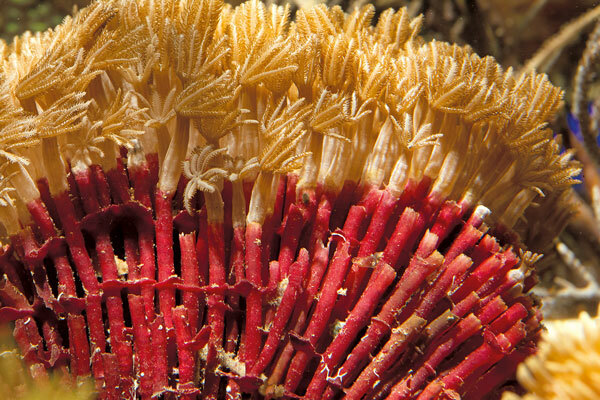 If the skeleton of an organ pipe coral exhibited clearly distinctive characteristics, it was often thought to be a new species. On page 204 of the school textbook Anfangsgrnde der Naturwissenschaft fr die Jugend (Natural History Primer for Young People) by Jakob Brand (1820; available free on Google Books), in a summary of the entire animal kingdom, there is an entry on organ pipe corals that appears typical of the times: Pipe corals (Tubipora), cylindrical, hollow, straight, and parallel tubes. In those days (and for decades afterward), many people weren’t aware that polyps were part of a coral’s anatomy. 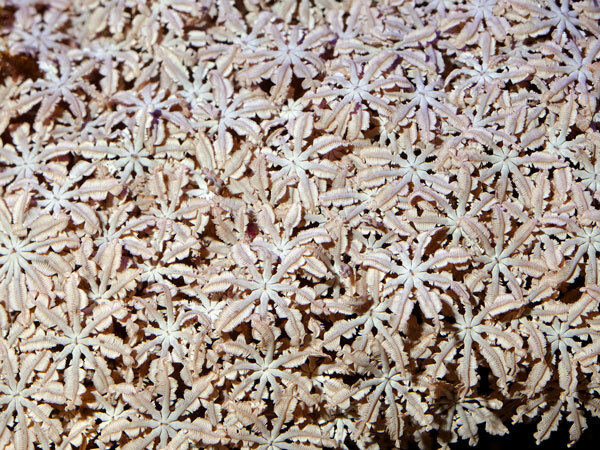 The unreliability of some of these species descriptions is evidenced by the fact that three organ pipe corals that were originally scientifically described as Tubipora later turned out to be tube-worm colonies: Tubipora arenosa is actually Sabellaria alveolata, and T. ramosa and T. filogranum are the colony-forming coral worm Filograna implexa, in all cases polychaetes of the subclass Sedentaria. In addition, the original type material on which the scientific descriptions were based is rarely still available. These ancient holotypes rotted away, were lost due to fire or wartime events, or disappeared for other reasons. The holotypes of T. fimbriata and T. syringa are stored in Harvard University’s Museum of Comparative Zoology, but they were preserved by drying. The only Tubipora holotype that is stored in alcohol and could be studied for a revision of the genus is in Paris (P. Alderslade, pers. comm. ), but it belongs to T. rubeola (Quoy & Gaimard, 1833), a species not recognized as valid. No original type material is known for any of the remaining species. 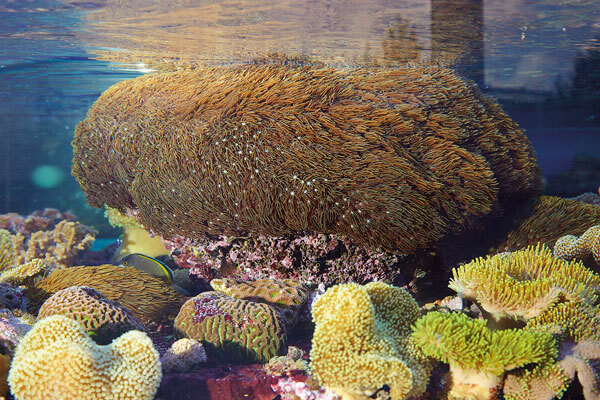 The matter is made more difficult still by the fact that only one organ pipe coral species has a wide distribution, and it is the only one that is well known in the aquarium hobby. All the other species have a much smaller distribution and have so far mainly been found on reefs in the Fiji Islands. So anyone who wishes to review their taxonomy to any extent must collect these rare organ pipe corals from faraway reefs, a difficult task, especially because almost all of them originate from deep water. Only two widespread species have been reported to inhabit shallow areas of the reef near the surface. Thanks to the enthusiastic support of Thilo Schwarz at Klle-Zoo and Werner Menzel at Meerwassercenter Menzel, Germany, I have managed to obtain not just the Tubipora species common in the aquarium hobby, but also seven additional phenotypes that clearly differ from one another. As a result, I have studied these organ pipe coral species intensively. With the aid of the chiller made available to me by Aqua Medic (thanks to Stephan Gohmann), the controller lent to me for the project by Dennerle (thanks to Dr. Carsten Gretenkord), and LED lighting, I have tried to maintain them to determine the aquarium conditions they need and, if the occasion arises, undertake the vegetative reproduction of species from deeper areas of the reef. Depending on whom you ask, science recognizes five to seven species as valid. A number of additional species are classified as synonyms, including the three tubeworm species mentioned above and T. purpurea, which has been declared a synonym of T. musica (duplicate description has purportedly taken place). But although that synonymization is recognized by science, it isn’t sustainable, because it is not clear what species Linn actually described as T. musica (P. Alderslade, pers. comm.). It is fairly likely that it is the one most commonly encountered on coral reefs and in the aquarium trade, precisely because of its wide distribution and its comparatively frequent occurrence on reefs, but there is no proof. And that indirectly affects other multiple descriptions: science is convinced that Tubipora rubeola is actually T. musica, but nobody knows exactly what T. musica looks like. The upshot of all this confusion is that the genus requires a complete revision, with redescription of all the species. Although authorities like the World Register of Marine Species (WoRMS) list five valid taxa, there may be far more species on the coral reefs of the world. On the basis of DNA studies, American marine biologist Cathy MacFadden (pers. comm.) says it is conceivable that there are actually eight or ten different species in existence. Having compared sclerites of various specimens, Dr. Phil Alderslade (pers. comm.) believes they might need to be split into two different genera. Considering the difficulty of assembling specimens of all the species, it is clear that such a revision would be no easy undertaking, and the current restrictions and conservation regulations enforced by many countries (including the United States and Indonesia) have made the loaning of preserved coral type material so much harder that some research projects have been impossible to complete. This Tubipora sp. 1 in a sales tank at Meerwassercenter Menzel shows the enormous growth potential of this species in the aquarium. As an aquarium hobbyist, I think it’s a great shame that we can’t tell the individual Tubipora species apart and simply call all organ pipe coral phenotypes T. musica or Tubipora sp. These variants originate from very different areas of the reef and cannot all be kept under the same aquarium conditions. Species that are found at greater depths almost invariably die in the aquarium because the special conditions they require are not met. They also need to be handled carefully by exporters, wholesalers, and retailers, because as little as a week of incorrect treatment can damage them irreversibly. Only if the individual species are distinguished can they be classified according to the depths at which they are found and the specific conditions they need. This is important, not only for the species you already keep in your aquarium but also for deciding whether to buy a new specimen. Because the rare Tubipora species are so attractive, there is a risk that they will be purchased spontaneously under the misapprehension that they will all be just as easy to keep as the familiar Tubipora musica. 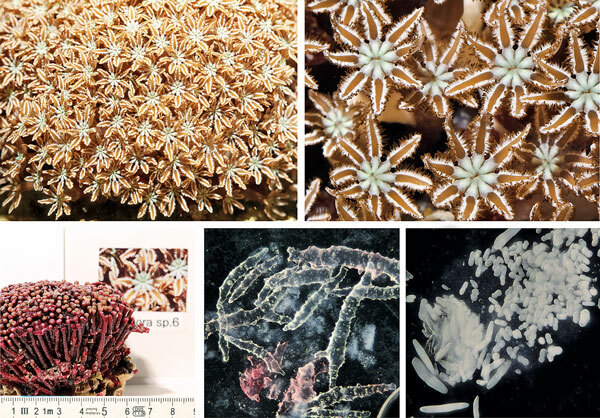 In an effort to ensure that these corals, which turn up so rarely in the trade, end up in the right hands, I will attempt to describe five of the species known to me in greater detail. Originally I planned to try to find a connection between living phenotypes and the scientifically recognized species, with reference to the early descriptions by Dana, Hickson, and others. Although that might not have been a valid approach, it would have been more clear to aquarists than just enumerating the species that are found on the reef. Naming each of these attractive coral species would enable aquarists to communicate about them and exchange information, instead of lumping them all together as Tubipora musica. But the difficulty of extracting details from the early descriptions and applying them to the organ pipe corals that are found on coral reefs today is considerable. Using this approach, I could not be certain which corals were being talked about back then. In only one case was I sure that I was looking at precisely the same coral that James Dana and others had described. Instead, I have restricted myself to enumerating the species as they were arranged for study on the bench in my laboratory, beginning by calling the commonly known species with the wide distribution “sp. 1.” In addition, I have preserved material from all the species in both formalin and alcohol, so that skeletal material and polyp tissue from these rare species will be available for research in the future. I have also isolated the sclerites from all the polyps and photographed them using focus stacking. Let’s first look at the descriptions of the scientifically valid Tubipora species, bearing in mind that most of us cannot say for sure what they actually look like. Overview of Tubipora sp. 1: colony, close-up shot, macro, skeleton (aquarium cultivated), polyp-base sclerite, tentacle sclerite (microscope stock photos). After an extensive description of the skeletal characters of Tubipora musica, described 88 years earlier, James Dana (1846) states that: “The animal of this species is not yet known.” By “animal,” he means the living polyp, and that leads to the assumption that Linn produced the original description on the basis of a dead coral skeleton. From this we must assume that Dana, who had scientifically described two new Tubipora species after a lengthy worldwide research trip, had researched the existing species with great care. It follows that other, more precise drawings and descriptions of T. musica polyps can only be based on conjecture, for example the statement by Voigt (1845) that the polyp arms are doubly pinnate, the polyps grass green. By contrast, Voigt’s drawing of a polyp (page 71, Fig. 32) is schematic and shows the tentacles as pointed and leaf-shaped, without pinnules. To sum up, all this means that nowadays we simply do not know which organ pipe coral Linn described. Were he alive today, he probably wouldn’t know either. 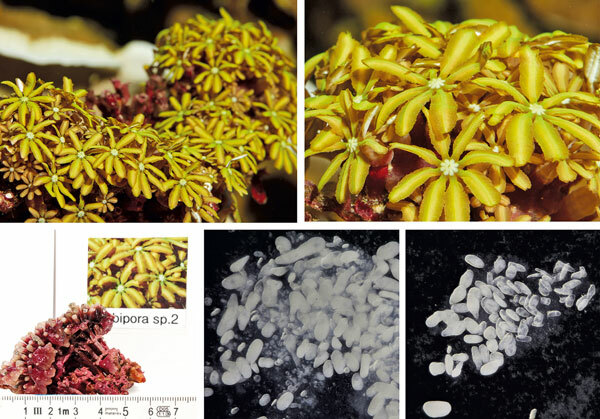 In a report on the United States Exploring Expedition (1838-1842), James Dana (1846) states, shortly after his original description of Tubipora syringa, what distinguishes this species from others: Papillae [presumably the pinnules, DK] in contact and arranged neatly in an even plane. This applies to the species shown here as sp. 2 and sp. 4. On page 128, Dana mentions another important detail when describing the habitat of the species: the Feejee Islands, in shallow waters along the shores. This habitat description rules out the deep-water coral sp. 4. Hickson (1883) writes something similar about T. syringa: In one of the species of this genus (T. syringa), they [presumably the pinnules, DK] are so evenly laid together that the fringe seems to be wanting. This description of evenly arranged, fused pinnules on the tentacles, causing the usual fringed appearance to be lacking, fits only with sp. 2, with its paddle-like tentacles, because even sp. 4, which also has fused pinnules, exhibits individual prolonged pinnules in many places along the edge, giving the latter a fringed appearance. In addition, sp. 4 originates from deep outer-reef zones and is unable to survive in the shallow-water habitat of sp. 2. It seems to me very probable that T. syringa is the species presented below as sp. 2. I therefore term the latter Tubipora cf. syringa (see page 74). Overview of Tubipora sp. 3, close-up shot, macro, skeleton (aquarium cultivated), polyp-base sclerite, tentacle sclerite (microscope stock photos). Dana (1846) describes Tubipora chamissonis as follows: Papillae [presumably the pinnules, DK] of the tentacles arranged in two series. This arrangement in two series isn’t found in sp. 1, and because of their completely fused pinnules, sp. 2 and sp. 4 can be ruled out without further ado. Tubipora chamissonis was found by Professor Ehrenberg at the Ratak Islands, a chain of islands in the Pacific to the east of the Marshall Islands far to the north of Fiji. Overview of Tubipora sp. 4, close-up shot, macro, skeleton (aquarium cultivated), polyp-base sclerite, tentacle sclerite (microscope stock photos). Tubipora hemprichi, originally described by Ehrenberg in 1834, bears an extraordinary similarity to Tubipora sp. 1. The type material for the original description originated from the Red Sea. James Dana (1846) describes the species as follows: Tentacles blueish or greenish [presumably the pinnules, DK] in a simple series. 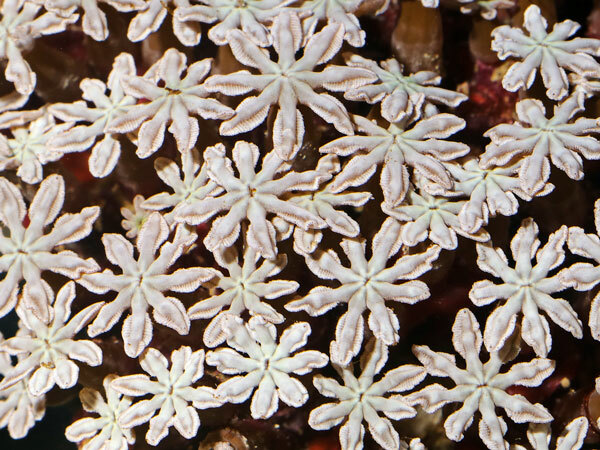 G. von Koch (1874) also describes this coral in his comprehensive work and provides numerous drawings in which the tentacles resemble those of the coral presented here as sp. 1. 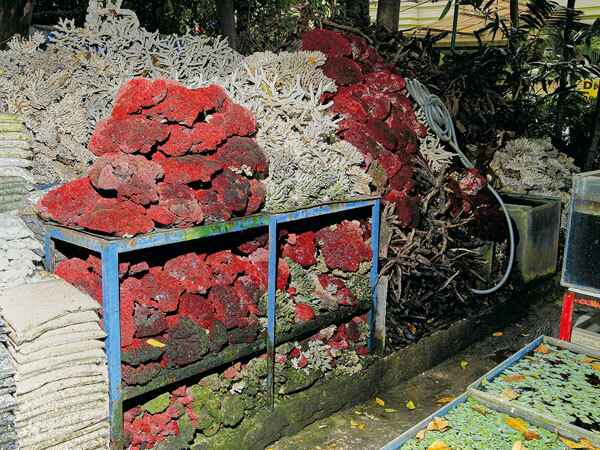 Whether this coral from the Red Sea actually differs at the species level from those that live in the Indian Ocean or the central Western Pacific requires further study, but its external appearance suggests this is not the case. Thus, T. hemprichi may be either a synonym of the (currently unidentified) coral described by Linn as T. musica or, as mentioned above, a similar representative of a whole group of species that remain undefined. Overview of Tubipora sp. 5, close-up shot, macro, skeleton (aquarium cultivated), polyp-base sclerite, tentacle sclerite (microscope stock photos). Dana (1846) describes this species as follows: “Disk of the polyps brownish red, mouth yellow, tentacles pale yellow, papillae violet.” A little imagination is required to recognize these colors in any of the corals known today, and the terms “disk of the polyps” and “mouth” are imprecise. But the naturalists of that time were unable to study corals as we do today, using photos and observing them alive on the reef or in the aquarium. They had to rely on corals that were brought on board the expedition ship and placed in containers of sea water to induce the polyps to open. In the majority of cases, they used preserved specimens, and such a dissected polyp differs considerably from the living animal in coloration. The perceived color of the live polyps is also heavily dependent on the light at the time. The locality given for the type material is “Feejee Islands,” on the outer reefs. So this doesn’t seem to have been a shallow-water species. Overview of Tubipora sp. 6, close-up shot, macro, skeleton (aquarium cultivated), polyp-base sclerite, tentacle sclerite (microscope stock photos). On the following pages, I turn to the species that I have been able to assemble for this article. Tubipora sp. 1 is a captive-propagated coral from Jürgen Wendel; sp. 2 is an import from the Fiji Islands from Kolle-Zoo; and sp. 3 through sp. 8 are imported specimens from Fiji, acquired from Meerwassercenter Menzel. 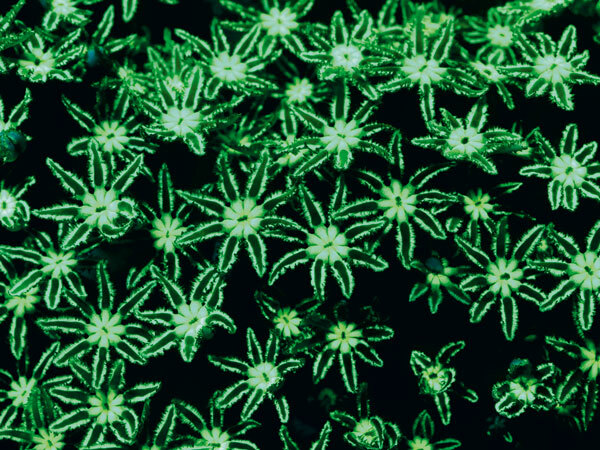 In the next issue of CORAL, we will talk about which Tubipora species can be kept in the aquarium and vegetatively propagated, how to go about this, and the challenges an aquarist might encounter. Author’s Note: I would like to thank Aqua Medic, Dennerle, Meerwassercenter Menzel, and Kolle-Zoo for supporting this research. Dana, J. 1846. United States Exploring Expedition during the Years 1838, 1839, 1840, 1841, 1842. Zoophytes. Lea and Blanchard, Philadelphia. Hickson, S.J. 1883. The Structure and Relations of Tubipora. J Cell Sci S223: 55678. Jones, T.R. 1861. General Outline of the Organization of the Animal Kingdom and Manual of Comparative Anatomy. John van Voorst, London. Knop, D. 2008. Gnseblmchen im KorallenriffEine neue Korallengattung. KORALLE 49, 9 (1): 6670.
. 2012a. Eine neue, alte BekanntePhenganax parrini. KORALLE 74, 13 (2): 8083.
. 2012b. Gast in vielen Riffaquarien: Sarcothelia edmondsoni. KORALLE 75, 13 (3): 6466.
. 2012c. Ein Knigreich fr einen Namen! Die taxonomische Odyssee von Metalcyonium verseveldti. KORALLE 78, 13 (6): 7275. Koch, G. von. 1874. Anatomie der Orgelkoralle (Tubipora hemprichii Ehrbg.) Ein Beitrag zur Kenntnis des Baues der Zoophyten. Hermann Dabis, Jena. Tournefort, J.P. 1719. Institutiones rei herbariae. Typogr. Regia, Paris. Treitschke, F. 1841. Naturhistorischer Bildersaal des Thierreiches, vol. 2. C.A. Hartleben, Pesth and Leipzig. Voigt, F.S. 1845. Lehrbuch der Zoologie. In: Naturgeschichte der drei ReicheZur allgemeinen Belehrung, vol. 12. Verlag der Schweuzerbartschen Buchhandlung, Stuttgart. Yabe, H. and T. Sugiyama. 1937. Sundry Notes on Living and Fossil Tubipora. J Geol Soc Japan 44: 3339.